Out of stock since Friday, 18 May 2018. Due back soon. For the treatment and control of ticks, headflies and biting lice on sheep. For the prevention and treatment of blowfly strike on sheep. POM-VPS. A mobile blue-coloured non-aqueous pour-on containing 1.25% w/v cypermethrin (cis:trans/80:20) for external application. For the treatment and control of headflies. For the treatment of tick infestation with a persistent efficacy of 10 weeks (the majority of ticks killed within 3 hours), and treatment of biting lice in sheep. For the prevention and treatment of blowfly strike on sheep. 5 ml per 20 kg bodyweight, up to a maximum of 20 ml. Using the straight nozzle on the recommended Crovect applicator gun apply as a pin stream from the shoulders to the rump along the middle of the backline. Sheep may be treated off-shears or anytime during the year. Adult sheep and lambs over 10 kg – 10 ml per 20 kg bodyweight, up to a maximum of 40 ml. One treatment will give 10 weeks cover. Lambs under 10 kg – 5 ml followed 3 weeks later by a 10 ml application. 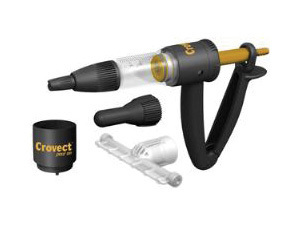 Using the straight nozzle on a recommended Crovect applicator gun apply as a pin stream from the crown of the head to the top of the rump. 5 ml per animal irrespective of size. Apply to the top of the head between the ears, using the T-bar nozzle. Take care not to apply the product in the sheep's eyes. One application of Crovect before the start of the headfly season will give up to 4 weeks protection. *Do not administer to animals of less than 12.5kg bodyweight at the blowfly prevention dose. Apply as a fan-spray to the surface of the fleece on the back and hindquarters of the sheep using a recommended Crovect applicator gun fitted with a fan spray nozzle. Half the dose should be applied on the shoulders, back and flanks and half to the rump. The distance between the nozzle and the fleece should be approximately 20 cm. Each dose will require 2 or 3 sweeps to apply. THE PRODUCT WILL PREVENT BLOWFLY STRIKE ONLY ON AREAS COVERED BY SPRAY. One application will give 6–8 weeks protection. Re-treat as required. Apply directly to all the affected parts at the rate of 2.5 ml per 100–150 cm2 (roughly the size of a hand). The T-bar nozzle should be used. Most strikes will require 5–10 ml. Ensure that all affected parts are treated. A single application is sufficient to ensure that larvae are expelled and killed within a few hours. This product contains a blue dye to aid in the identification of treated animals. The colour is temporary and will fade from the fleece within 48 hours of application. Not to be used in lambs less than 1 week old. Avoid treating very young lambs if the weather is unseasonably hot. For the prevention of blowfly strike; do not administer to animals of less than 12.5kg bodyweight. Take care not to apply in the sheep's eyes. This precaution should be observed particularly when treating breeds with little wool on their heads. Crovect minimises mothering-up problems after treatment. However, care must be taken not to apply the product right to the lamb's tail as a ewe recognises a young lamb by the smell of the tail area. WEAR EYE PROTECTION, PROTECTIVE CLOTHING, RUBBER GLOVES AND BOOTS when applying the product. WEAR A DUST MASK when applying as a fan-spray for the prevention of blowfly strike. WASH SPLASHES from skin and eyes immediately. If irritation persists seek medical advice immediately. DO NOT EAT, DRINK OR SMOKE when using the product. Meat - Animals must not be slaughtered for human consumption during treatment. Sheep may be slaughtered for human consumption only after 8 days from the last treatment. Milk - Not to be administered to animals producing milk for human consumption. Store in tightly closed original container, in a safe place. Do not store above 25°C. Protect from direct sunlight. Store away from food, drink and animal feedstuffs. 0.8, 2.2 or 5 litre backpacks. 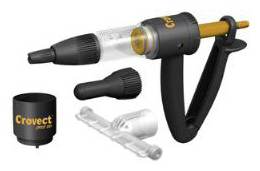 Crovect must be applied only with the recommended applicator gun as the product may have a detrimental effect on certain components of conventional dosing guns. Full operating and maintenance instructions, including details on the use of nozzles, are supplied with each applicator gun. Maintain applicator gun carefully to ensure accurate dosage. Blowflies are attracted by dirty, damp wool or open wounds. The most common site for flystrike is the rump, due to soiling caused by diarrhoea and urine staining. 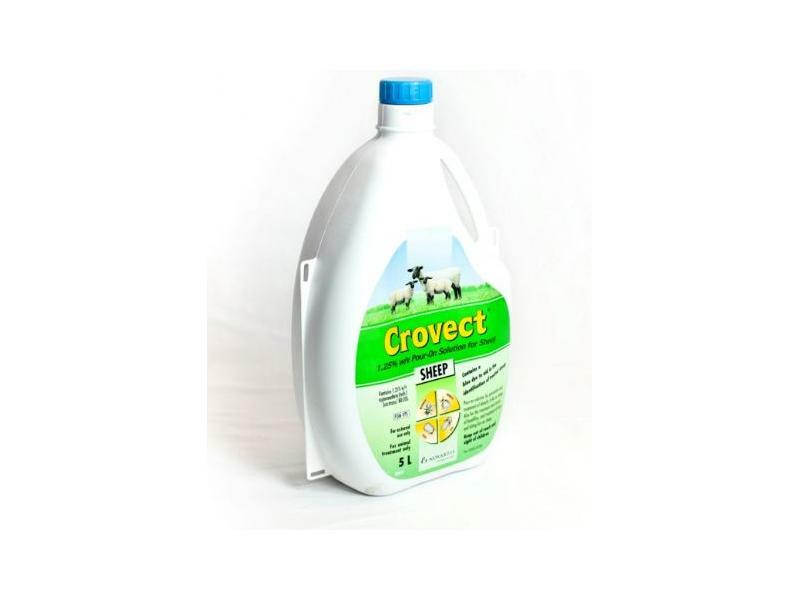 The efficacy of Crovect is reduced in the presence of soiled and dirty wool. Therefore sheep must be crutched (dagged) regularly and appropriate worm control measures employed. Below are some recent questions we've received regarding Crovect Prevention Of Blowfly Sheep Pour On, including answers from our team. can i shear my sheep straight after application? You can, however the product would be more effective if you shear the animals before an application of Crovect. This is just to allow for the product to do its job once in contact with adult and larval stages of blowfly. Animals must not be slaughtered for human consumption during treatment. Sheep may be slaughtered for human consumption only after 8 days from the last treatment.